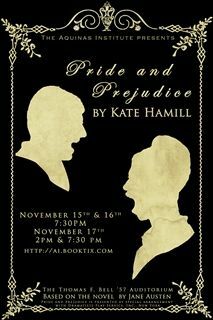 Aquinas Institute's fall play, Pride & Prejudice, will be on stage Nov. 15 and 16 at 7:30 p.m. and Nov. 17 at 2:00 p.m. and 7:30 p.m. in the Thomas F. Bell '57 Auditorium at The Aquinas Institute (1127 Dewey Ave., Rochester, NY 14613). Jane Austen's classic tale comes to life in this zany new adaptation of the novel. In Regency, England, the charming Bennet sisters navigate the rocky terrain of love and marriage, encountering a famously wacky cast of characters along the way. Laugh, sigh, and swoon as the lively Elizabeth and reserved Mr. Darcy discover that all's fair in the war of love, where their worst enemies might just be themselves.